Here's what you have: A shifter kart. A bunch of GoPros. A pro driver. An empty race track. An old set of tires. What do you do? You drift like mad. 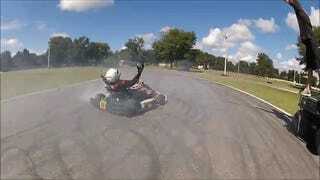 This video combines a slow day at Ocala Gran Prix in Ocala, FL with shifter kart legend Gary Carlton and filming by Scott Speed's little brother Alex. What you end up with is a tire smoking good time. Ocala is a great track for this too. I raced a kart there years ago, and I remember the surface as rather low grip and it also had a number of long sweepers. Fun track, if a little dusty (ok, a lot dusty). Sounds like tire destroying heaven.